Tidal announces Apple CarPlay support | What Hi-Fi? Available from iPhone 5 forward, this move means you'll be able to play your tunes through your car's visual dashboard system. 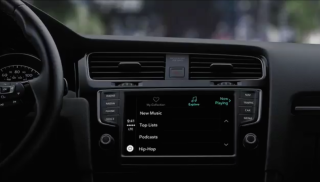 Music streaming service Tidal has announced it is now compatible with Apple CarPlay, so you can easily play your favourite tracks while driving all night (your hands wet on the wheel etc) via your car's dash-integrated screen. CarPlay support is available on iPhone 5 and newer today. For those who would rather use an Android phone, though, there is no word as to if or when Tidal will support Android Auto. This news follows the BBC announcing a car-friendly version of its iPlayer app will also be available for Apple-enabled cars.